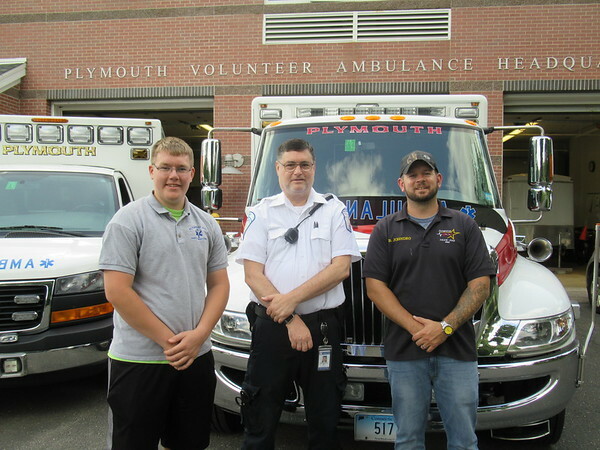 PLYMOUTH - The Plymouth Volunteer Ambulance Corps is celebrating its golden anniversary. It was founded 50 years ago this month, although the exact date is uncertain, according to its longest-serving current member, Lani Johnson. Johnson, president of the PVAC Board of Directors, said she wasn’t there at the beginning but has served for 40 years, including 25 as an emergency medical technician. The first volunteer EMTs only needed six hours of first aid training back then, compared to the 180 hours required today. The ambulance was stationed in private garages around town until the corps got its first permanent home at an old fire station on North Main Street, Johnson said. The corps then bought property at 191 Main St., across from Baldwin Park, and the town agreed to finance a modern facility, which opened about 15 years ago, she said. The current location has three large garage bays, which house the ambulances known as Units 111-1 and 111-2, which cost about $230,000 each, as well as a 2002 Ford Expedition, a trailer that hauls equipment for events including the Terryville Fair, and six bicycles, which the Explorers ride at parades and other public events to spot emergencies. Upstairs, there are dormitory and bathroom facilities for men and women, a day room with a computer and TV, a training center classroom, a kitchen and a laundry room. “We have everything we need. When we have big storms, sometimes you have to be here for longer than a six-hour shift,” explained Chief Brandon Johndro. The corps bills patients’ insurance companies and is supported by the town, which owns and maintains the ambulance building and the ambulances, she said. Johnson said she joined the board in 1978, yet women weren’t allowed to be on the ambulance crew then. “It was a couple of years later, when we just didn’t have enough EMTs, that I and two other women took a class and became EMTs. We weren’t the very first ones. There was a woman before us, but I don’t remember who she was. Now, I think almost half are women, and that’s true in all the commercial ambulance services too,” she said. “They used to say women can’t lift patients, but what do nurses do all day?” she added. Another change over the years has been the town’s move to relying on a commercial ambulance service weekdays from 6 a.m. through 6 p.m., when most of the volunteers are at their regular jobs. Portland-based Emergency Resource Management has two people on staff for the day shifts, using the PVAC ambulances, while volunteers are on staff 6 p.m. to 6 a.m., and weekends and most holidays, Johndro explained. You need at least two people per shift, either two EMTs or an EMT and an EMR (emergency medical responder) who can assist and drive the ambulance if he or she is over 21, he said. Johnson said she is proud of the service the corps has provided over the decades. “I’ve spend more than half my life on this ambulance corps, 40 years, and I care a lot about it,” she said. Johndro feels the same way. Many patients send cards or letters after they recover, said Norm Whitehurst, the corps’ captain of operations. “Sometimes people will come up and say, ‘I remember you, you helped me.’ It’s a great feeling,” he said. The number of calls the corps responds to has been growing over the years, averaging about 1,500 a year now, Johndro said. “We deal with everything from dire emergencies to sick parties that might just need to be transported. We do have several elderly facilities in town,” he said, noting that opioid overdoses have become a problem in town, just as they have nationally. “We also have people who have what we call jump bags in their personal vehicles, fully stocked with medical supplies, so they can go to the scene,” Whitehurst noted. The corps now has about 25 active members and could always use more, Johndro said. EMT training can be expensive, but with a grant from the Federal Emergency Management Agency, the corps is planning to offer free training this fall to about 20 students willing to commit their time. Many of the EMTs start out as members of Explorers Post 111, which is for ages 14 to 18. That’s how the corps’ newest member, Brian Collins, got his start. Collins, 18, is attending UConn Hartford, studying respiratory therapy. He became CPR-certified as an Explorer, then progressed to the EMR level, and is now EMT-certified. The corps will hold a 50th anniversary celebration for active and former members on Sept. 21. An open house for the public will be held on an October date to be announced. For more information, call 860-589-2313 or find the corps on Facebook or at . Posted in The Bristol Press, Plymouth on Tuesday, 4 September 2018 21:22. Updated: Tuesday, 4 September 2018 21:24.